The Razer Phone 2 should be official next month, on October 10, but you can rest assure that more leaks of the smartphone will come forth. On this occasion, a known leakster has decided to present a leaked press render of the gaming-centric smartphone and to be honest, there is not a whole lot of differences between it and the predecessor. Still, we will let you check out the leaked image and figure out the differences if you can spot them. Thanks to Evan Blass, we have a closer look at what the Razer Phone 2 will look like and before we say anything, the design more or less looks the same as the original Razer Phone. It sports that same industrial design with a boxy look, which we’re expecting is going to be completely aluminium and extremely durable. However, with the trend of smartphones sporting thinner bezels from all four sides, the Razer Phone 2 is going against this approach. However, this can actually be a blessing in disguise, because the top and bottom part of the Razer Phone 2 will actually accommodate high-quality speakers with their own dedicated amplifier. 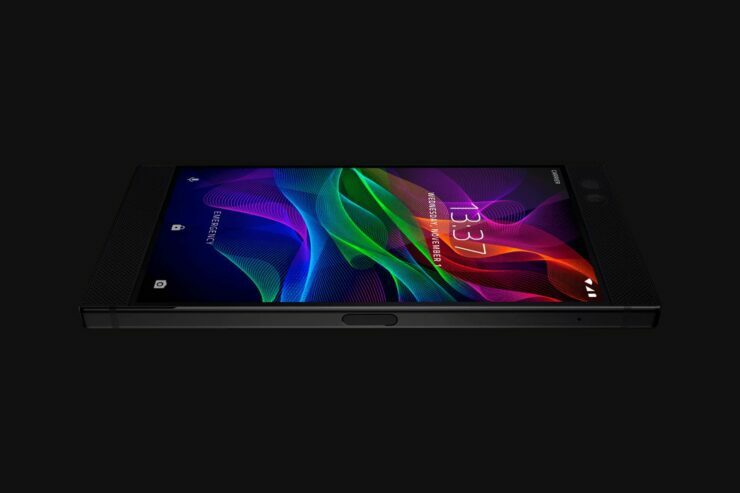 If you recall, the Razer Phone featured immaculate sound quality for a smartphone and that made media consumption all the more enjoyable on that device. However, the 3.5mm audio jack is not making a return to the upcoming flagship, so the only port that will be visible on the smartphone will be that Type-C USB one. With this port, we expect Razer to bundle a Type-C USB to 3.5mm audio jack adapter so you can connect your peripherals to the smartphone easily. We certainly hope that the peripherals manufacturer has also improved the camera hardware and software because according to reviewers, the previous-generation handset had an abysmal dual-camera, which was made worse thanks to its terrible software. Coming to the internal specifications, though we expect the Razer Phone 2 to feature a Snapdragon 845, a leak has pointed towards the presence of a Snapdragon 835, coupled with 8GB RAM, 512GB internal storage but no expandable memory. Other features include a large thermal heat pipe solution and a bigger battery capacity for an all-day endurance. What sort of changes are you looking forward to from the Razer Phone 2? Tell us your thoughts down in the comments.